I spent 10 hours playing The Division 2’s beta this week and didn’t see half of it. The March 15 shooter about combat in a ransacked Washington D.C. is going to be another super-sized Ubisoft game, and even its beta was bursting with interesting things to do, amid some spots that got me worried. The good news is that The Division’s core mechanics as a cover-based shooter still feel satisfying, and the world they’re set in is once again terrific to look at. 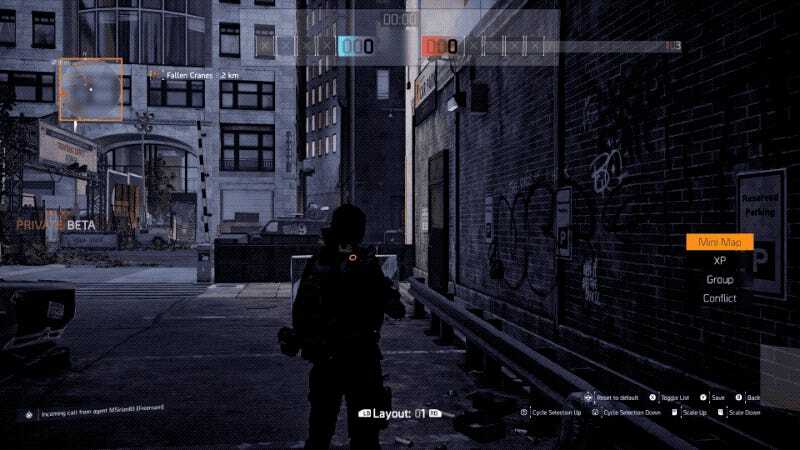 At the most basic level, The Division is about running through a city, pressing your character’s body up against cover and shooting at enemies. Zoom out even more and, in the abstract, The Division games are another version of Diablo or Destiny. They are games full of loot and ever-increasing character stats that give players so many types of missions and activities, all of which involving getting more loot and trying to improve even more numbers. Such games threaten to be as consuming as a full-time job, without the benefit of a paycheck. Fun as much of the beta was, its biggest downsides were the aspects where it felt most at risk of feeling like work, mostly by occasionally feeling monotonous. The beta gave players access to two large zones of virtual D.C. out of what appears to be a dozen on the full map, along with the White House HQ and one of three contaminated Dark Zone areas. All of that terrain was stuffed with things to do: main missions, side missions, semi-random world events, safe houses to be unlocked, a civilian-filled settlement to upgrade, checklist “projects” to complete, enemy control points to take over with the help of allied militia, audio logs to listen to, and more. In my 10 hours I didn’t touch the game’s player-versus-player Conflict mode. I only did the introductory mission for the Dark Zone, that returning concept from the first game that mixes player-versus-environment and PvP in a high-stakes setting where you’re finding contaminated loot and calling in a helicopter to extract it, or attacking other players to take theirs. With its own leveling system and stacks of unlockable perks, Dark Zone seems to be a game unto itself, one I just didn’t have time for yet. 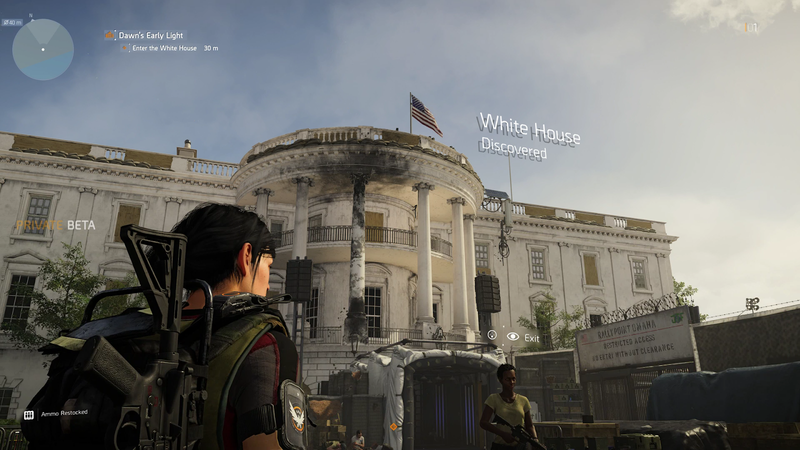 I spent my time in the game’s open world and in its missions, detouring on Sunday to then try the beta’s slice of The Division 2’s endgame, which is set after a new enemy faction, Black Tusk, shows up and “invades” the game map and some (all?) of the game’s story missions. The open world is as lovely as virtual devastation can be. The first game’s snow-filled disaster of late-November, early-December New York City has been left behind for the overgrown swamp of post-disaster D.C. in the summer. Plants are thriving, even if people aren’t, and deer regularly run down the street. It’s startling for a returning Division player like me to see so much green on the ground and blue in the sky, though the game obliges any nostalgia for the dreary with the occasional downpour and flash of lightning. There’s much to see, and it’s tough to sustain the reflex to just stop and admire all of the stuff Ubisoft has drawn into the world. No one, just no one in video games renders a pile of trash bags like the people making The Division 2. Despite the addition of a photo mode, The Division 2 is not primarily being sold to be gawked at. It’s a mega-game from a mega-publisher designed to give you a mega amount of things to do. Those main missions and side missions I tried were okay. I generally crept into a building (a hotel, a mall, et cetera), ambushed some patrolling enemies, used my guns and my special drones and turrets and rolling seeker mines to fight them, plunged forward to some central objective involving another gunfight, and then would be directed to fight my way back through the way I came, fighting enemy reinforcements along the way. Moment-to-moment combat mostly felt good, but the mission design was basic and reminded me of my disappointment about how forgettable the missions in the first game were. More promising were some of the activities out in D.C.’s open world, which feel designed to give a sense of an evolving city that offers visual and gameplay changes as you build it up. I’m a sucker for upgradeable bases in video games, so I was delighted to enter the first of the sequel’s Settlements, a new location idea for the franchise involving civilian-run zones that can be improved over time. The beta’s settlement is called The Theater and started as a bare-bones set of decks where people were struggling to get by. Soon enough I was able to get one of the people there to head back to the White House to set up a crafting station and also unlocked a slew of side missions. Various messages popped up as I played suggested that more upgrades to my settlement would unlock even more side missions and that other settlements would contain other people who would move to the White House to expand that base’s functionality. Soon enough I was adding new facilities to the Theater, some of which were just cosmetic but gave the feeling of a community rebuilding. After I finished a side mission involving civilians trapped in the Martin Luther King, Jr. Memorial Library, my rewards weren’t just some experience points but the creation of a game room back at the Theater settlement. Without me, the kids at the Theater wouldn’t have a TV on which they could play For Honor and wouldn’t have access to a board game version of Ubisoft’s little robot adventure Grow Home. The discovery of Settlements and Safe Houses also seem to be the triggers for another new concept in the sequel called Projects. These are glorified Destiny bounties—or really any other kind of gaming checklist task that offers a light amount of narrative justification for a to-do list that doles out experience points and a new item. The beta kept the community upgrade loop short, though the first time around was plenty satisfying. In the full game, the Theater can be upgraded four levels, and the White House will eventually be staffed with six special recruits as it, too, is upgraded. If the rounds of upgrading keep offering interesting side tasks and a compelling sense of societal recovery, great. If they feel like just more rivers of effort for frivolous outcomes, not so great. It’s hard to say, because Ubisoft games are renowned for being based on gameplay loops that feel satisfying the first time but aren’t always wonderful when the player is asked to do them a hundred times more. The conceit of these loops is good, though, and hopefully will prove to be a good showpiece for the development team’s artists. Some old ideas from the first game appear to be returning in new guises. The first Division had named enemies called High Value Targets roaming the world that were only discoverable after players did some tasks to get them to emerge. In the beta, completing one Project triggered the identification of a named enemy who was designated as a Bounty. Like a High Value Target, they were only trackable for a set period of time before players who failed to defeat them would have to wait for a new chance. The first game also was busy with gear, including clothes to wear, stat-based tactical armor pieces to wear over that, and a slew of weapons to collect and mod. That’s all back, along with gadget-based skills that themselves have an eye-popping array of options for mods and upgrades. You don’t just get a drone that can hover near you, for example. You can earn the ability to use that drone to send small bombs or to snipe designated targets. That drone can also have its battery, hull, and more modded. Your loot can have loot, your skills can have skill trees. It all goes on and on. It’s a lot, and it helps make the prospects for this game teeter in mind between being fun and being an onerous spreadsheet. Which will it be? The original Division handled allies and enemies poorly. Allies were either stumbling civilians desperate for a bottle of water or allied soldiers barely more helpful in a fight than a strong breeze. Enemies seemed pathetically desperate, too, save for the fact that they were bullet sponges who tended to take too long to kill. Allies in The Division 2’s beta are green-marked civilians who run supplies down the streets and who will answer a shot in the sky from your flare gun with actually useful assistance. You can call them in when you try to clear enemies out of the new Control Point zones set up in the open world. I had a good time getting these allied pals to help me take over an intersection where massive construction cranes had fallen and also get control of a construction site. The loop for this is odd and could be annoying, as the allies who then run the control points need water and other supplies for the apparent perk of revealing more loot in the game world for a short period of time. It’s hard to tell from the beta if it’ll be worth it. Enemies simply seem smarter and take fewer shots to kill, both of which make the combat in the beta immediately more fun than what launched in the first game. Even basic enemies that I fought in the beta moved around a combat area, preventing me from camping behind any one spot of cover for too long. Tougher enemies sent drones at me, hurled grenades, and aggressively flanked. If anything, the enemies might be too aggressive as higher-end enemies constantly spam drone and grenade attacks. The developers can tweak that and hopefully will. The Division 2’s most interesting gambit is a supposed transformation of the game and its missions once the basic storyline campaign is completed. At that point, a new enemy faction called Black Tusk invades. Players who finish the campaign also choose what amounts to a character class, or in the parlance of this sequel, a specialization. All involve the addition of a signature weapon, a special grenade, and some new abilities. A Sharpshooter specialist wields a huge sniper rifle, a demolitionist a grenade launcher. I tried the beta’s endgame mission as a survivalist, which meant that my character was able to carry a crossbow that fires explosive bolts and could use a drone that could heal allies. I wish I could say I put those skills to good use, but I found myself just struggling to fend off Black Tusk with conventional means and wasn’t ready to learn these new skills. Combat against Black Tusk was tough. These guys have healers and jammers and robot dogs. Compare a battle against regular enemies in a hallway of one of the beta’s missions with the invaded version. The invaded mission was far more difficult than the basic version of the mission. I got trounced a dozen times when trying to solo it, but when I matchmade with three strangers, we chopped our way through it. It reminded me what made the first game’s unexciting main missions much more interesting: the presence of other players in co-op. Real people enhanced the experience in the beta, too. Guess I probably should have enhanced their experience by actually using my healer drone. Next time! I partially played the first Division for its peripheral story. It’s main story was generic Clancy-branded drama of doomsday weapons, elite soldiers, and the best use of ballistics. In the game’s ample nooks and crannies were audio logs telling multi-part dramatic personal stories of regular New Yorkers before and after the attack. The snowy streets also were a canvas for environmental storytelling written by tire tracks in the snow. Some of those good touches are evident in the Division 2 beta, which includes a smattering of intriguing audio logs that could be set-ups for more serial audio narratives. And even without the snow, the overgrown streets and city blocks of D.C. still wordlessly tell some stories. A game with this many parts needs two fundamental things: enough interesting stuff to do in it and enough people playing it. It’s hard to tell if Division 2’s loops will keep feeling fresh as they’re repeated, not without being able to play more deeply into the game, without seeing if the second settlement upgrade is as interesting as the first or if the next entire settlement is distinct enough from the first one, and without being able to climb the skill trees. Combat does feel better, but it isn’t without its own risks of monotony. The presence of other players will be a boon, should enough of them show up. Ubisoft is offering so many modes at launch—PvP, Dark Zone, open world and, soon after launch, eight-player raids—that a new standard question must be asked for this latest of Ubisoft games: will it be too big? Will we all have time for this latest mega-game? The Division 2 launches in a month.